An industrial disaster in Yancheng kills at least 47, injuring over 640. The People’s Republic of China has grown at an unprecedented economic pace in the last three decades. However, the nation has been beset by a number of industrial accidents in the recent past. In 2013 alone four major mining disasters resulted in the deaths of over 100 people. In 2014, a dust explosion in Kunshan, Jiangsu, at an automotive part manufacturing facility resulted in the deaths of over 140. In 2015, 165 people were killed by a number of explosions at a chemical warehouse in Tianjin, close to Beijing. In 2018, a series of blasts at a chemical manufacturer killed over 20. Although the government has consistently pledged to improve safety regulations, there have been a number of disasters, especially at chemical plants. The issue has garnered much public consternation. 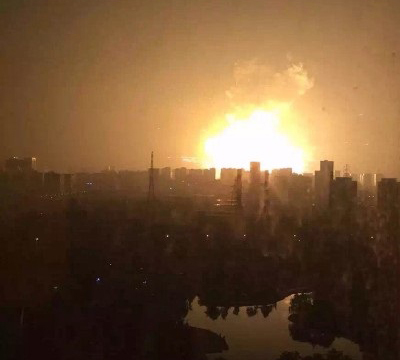 On March 21, 2019, a blast occurred at the Chenjiagang Industrial Park in the city of Yancheng, Jiangsu. The resulting fire was only brought under control the following day. At least 47 people have died, with over 640 people being treated for injuries at 16 different hospitals. Public anger over safety standards in China will continue to grow as a result of the recent disaster in Yancheng. The disaster is unlikely to undermine Mr. Xi’s leadership, although China will intensify its efforts to ensure safety measures, especially in chemical firms. Our assessment is that China is likely to boost inspection and security regimes amongst its industrial facilities. However, we believe that without close monitoring, such a disaster may occur again, especially given China’s recent industrial history. We also believe that increased regulation may dissuade the expansion of China’s industry, and the nation is likely to take a middle-path to ensure growth continues while ensuring best-practices in safety.